Somehow or other Nostradamus always seems to sneak into anything cataclysmic. 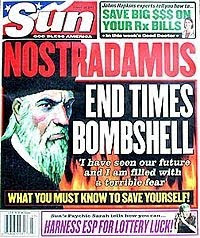 How has Nostradamus gotten into the 2012 end of the world scenario? Dr. Hitchcock: Nostradamus was the French prophet, or alleged prophet, who used to look into pieces of glass or water. He used this method called "scrying" and would come up with these alleged prophecies written in four-lined quatrains. Scrying is an occultic method which should tell anyone who believes the Bible and is a Christian that Nostradamus was way off. The quatrains he wrote are very vague and could apply to all kinds of situations after the event. It is kind of like the old saying, "even a clock that doesn't work is right twice a day." "The seventh month of the year 1999 the great kind of terror would appear in the sky, and the king of the Mongols would come forth." Well, that didn't happen because we were alive then. And so, we know that at least on that account where he was actually very specific that he is a false prophet. I don't think we should put any stock whatsoever in anything Nostradamus had to say. Dr. Reagan: I would agree 100% with that! I did a lot of research on Nostradamus one time and I found as I would read those quatrains that they made no sense whatsoever, but people would see all kinds of things in them after the event. I found out something else, too, that you probably know, and that is when you are looking for quatrains on the Internet by Nostradamus you have to be very careful because quite often his followers rewrite them to make them say what they want them to say. There are all kinds of false quatrains out there. Dr. Hitchcock: That's right, after 9/11 there were several false quatrains about the two towers. But, then, people went in and added other things to them to make them fit even better with what happened at 9/11. Dr. Reagan: I understand there has been a new book found by him that he had written and actually illustrated. It has not really been released to the public yet, but there is speculation that there are prophecies concerning 2012? Dr. Hitchcock: Yes. It is called The Lost Book of Nostradamus. You can get on the Internet and look it up and see his drawings, and that is where some say he points to 2012. But, the problem is that a supporter of a 2012 end-of-the-world scenario might look at these intricate drawings and they'll say, "that this means this, and this means this, and this means this, therefore it points to 2012." But, if they're wrong at one point along the way it is like a house of cards — it all comes down. Nathan Jones: That reminds me, back in the 1980's Orson Welles did this big special on everything Nostradamus said, and he predicted J.F.K. getting shot and everything all the way up to that point that Orson Welles did that show. He then made a big deal about looking into the future. He said Nostradamus predicted world cataclysms for the last part of 80's and the destruction of the world in the 90's, but no such thing happened. Dr. Reagan: What always confounds me about Nostradamus is the fact that the world will give him so much significance and importance, but his vague statements have no meaning whatsoever as opposed to the precise, specific prophecies in the Word of God about the future that are being fulfilled right before our very eyes. The world just ignores those. Dr. Hitchcock: That is right. There are hundreds of prophecies in the Bible. In fact, Dr. John Walvoord said there were 500 that have been fulfilled. The Bible has a verifiable track record we can put to the test, such as predicting Cyrus over 100 years before he was born by name. And yet, people will turn to Mayan calendars and Nostradamus instead of the Bible. It really shows the heart of man and it blinds them. Nathan Jones: They're blinded by a prejudice against God. Dr. Reagan: When you start talking about Bible prophecy people say all that stuff about the Messiah we just read that in there. They don't understand that in addition to Messianic prophecies there are 100's of prophecies about nations, about individuals, about cities and towns that have been fulfilled already. Dr. Hitchcock: Yes, it is a verifiable track record we can look at. The Bible really proves to us that it is self-authenticating and that it is from God.